Medion is known for its budget laptops, but it also makes machines for multimedia use. 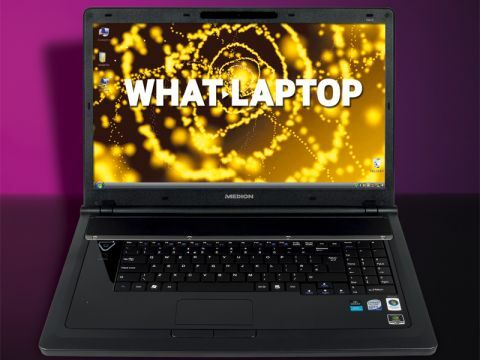 The Akoya P8610 is the largest and one of the most feature-packed laptops around for the price. The 18.4-inch screen is huge and great for watching ﬁlms on, and the integrated Blu-ray drive lets you really get the most out of it. Images are crisp and colour reproduction is great. The glossy Super-TFT coating results in quite a reﬂective panel, however, with reﬂections proving intrusive even when used indoors and out of bright lighting. The Akoya steals a march over its rivals when it comes to multimedia use. It's the only laptop here to utilise two graphics cards – Nvidia's entry-level GeForce 9100M and a powerful GeForce 9600M GS – set up in an SLI conﬁguration. This offers the best of both worlds with a battery life of 187 minutes when using a single GPU, and powerful 3D performance, capable of running the latest games when using both. The keyboard offers large keys that are responsive and comfortable to type on, but the board is too spongy, ﬂexing under pressure, and the keys also move around more than we'd expect. The numeric keypad is also slightly compromised and crammed in against the main keyboard. The touchpad features the same wide aspect ratio as the screen, making it easy to accurately place the cursor, and the buttons below are large and responsive. Aside from the springy keyboard, build quality is impressive, with strong plastics used and an industrial-looking design. This machine is reasonable in daily use, aided by a mid-range 2GHz Intel Core 2 Duo processor and 4096MB of memory. It's not the fastest laptop available, but it's more than capable for multi-tasking, and runs smoothly at most times. The 320GB hard drive provides more than enough space for movie, music and photo collections. Unsurprisingly, considering its size, this is one of the more fully featured laptops for the price. You'll ﬁnd four USB ports and it comes with its own plug-in TV tuner, which slots neatly into the ExpressCard port. An HDMI port is in place, letting you connect a high-deﬁnition (HD) TV, and an eSATA port offers fast connections to external hard drives. Wireless networking is fairly standard, running at 802.11n speeds, though Blutooth is omitted. If you're seeking a multimedia centre, then few laptops can compete with the Akoya P8610. The keyboard may be compromised, but there's a lot of laptop available here for the money.